I have been bicycle commuting since college and have been commuting to work regularly since then. Described below are some bicycle trips I have taken. Bit of an update, all is well and came out of it fine, but got out of shape. Going forward will get back into shape and hope to start taking trips shortly! Took sick in June by what could have been a serious illness, it was 100% cured by an operation in Sept. So, this derailed (pun intended??) 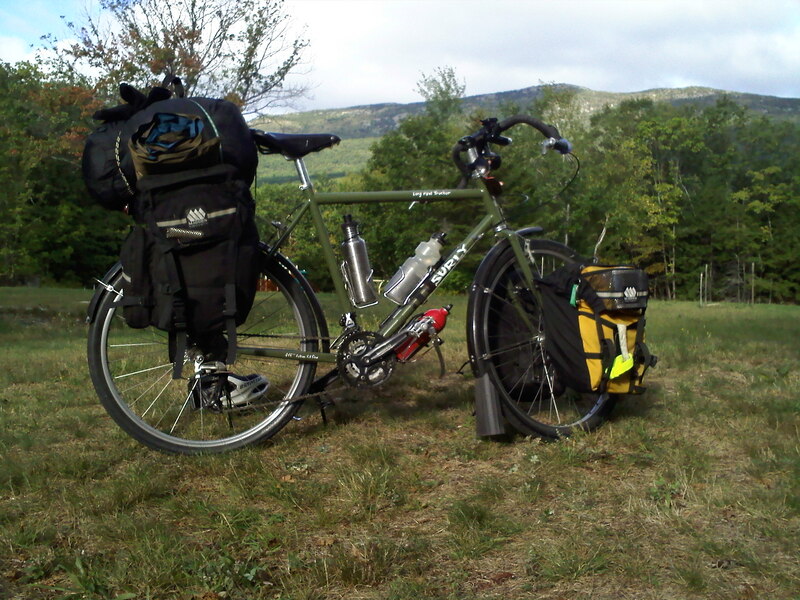 any bike trips in 2012, now planning what to do for a trip in 2013! I was planning on following this route route on a cc tour, but Hurricane Irene destroyed many bridges and roads in Vermont. So I planned a new trip (Plan B), this was suppose to go up to the White Mountains and beyond. But Week 1 of my vacation I caught a cold, and another but weak hurricane remnant came through at the same time, it rained hard during the week. With a lot less time remaining, I decided to do "Plan C", this is a trip I have been planning for quite a while. In retrospect this was probably the best trip to take due to the changeability of the weather. I also wanted to wait until the heavy rain and my cold was gone. This time I used a light "lighter" load. 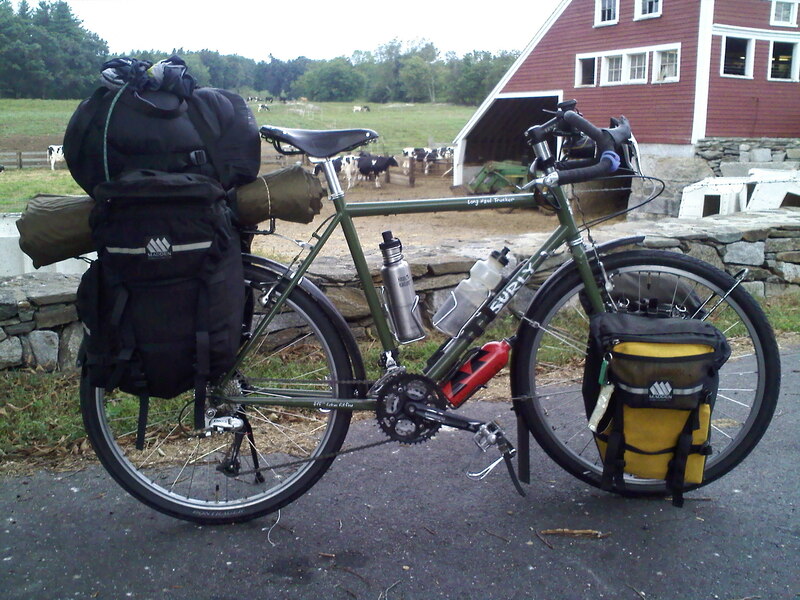 I called it "an ultra light tour on a 30 pound (13kg) bike". (I do not think the LHT. weighs 30 pounds (13kg), but the phrase sounds good). This is what my packed bike looked like and this what I carried. This time I weighed the load, turned out it was around 25 pounds (11kg). Past years I believed I carried around 40 pounds (18kg). This map shows the route I took in New Hampshire. The bottom part pretty much aligns with the Mass/NH border. 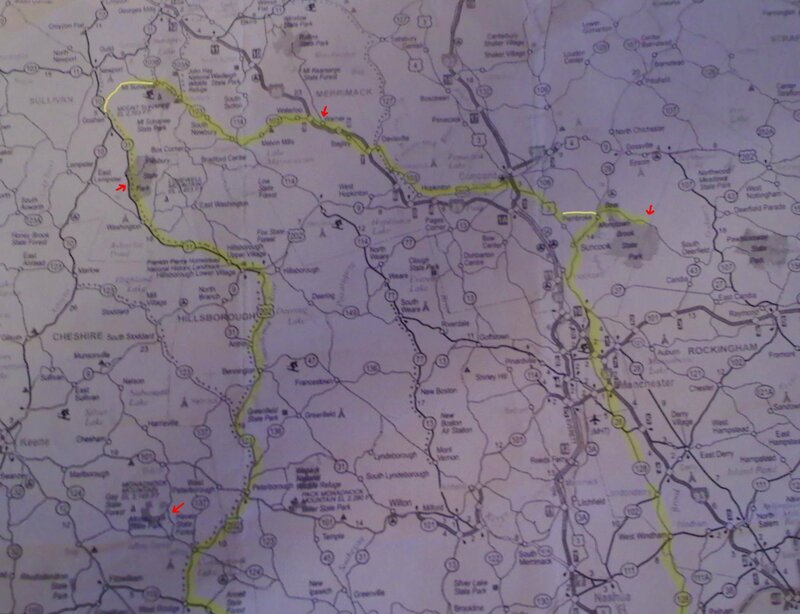 Red arrows shows where I spent the night, bright yellow lines show roads I took which are not on the map. The loop was counter clockwise. 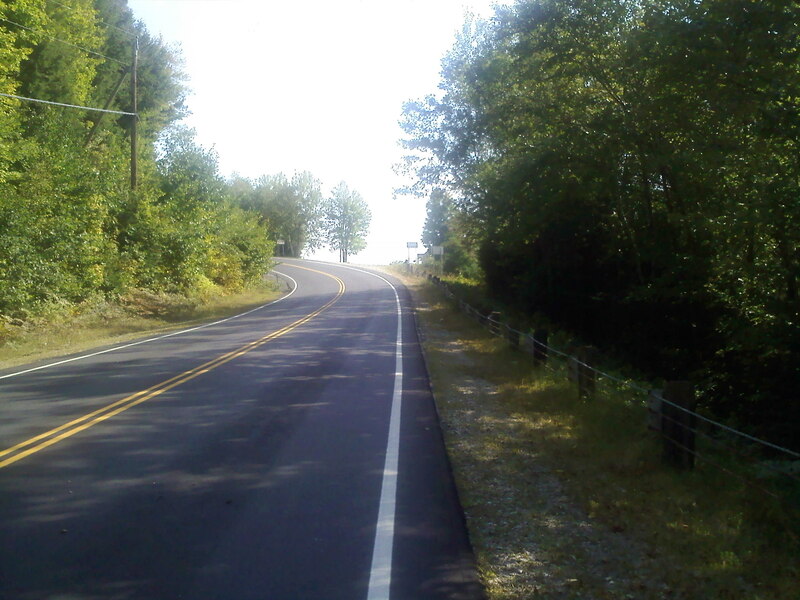 The route in Mass is quite easy and how to get to the start and end of this ride is described below at the end of this page. 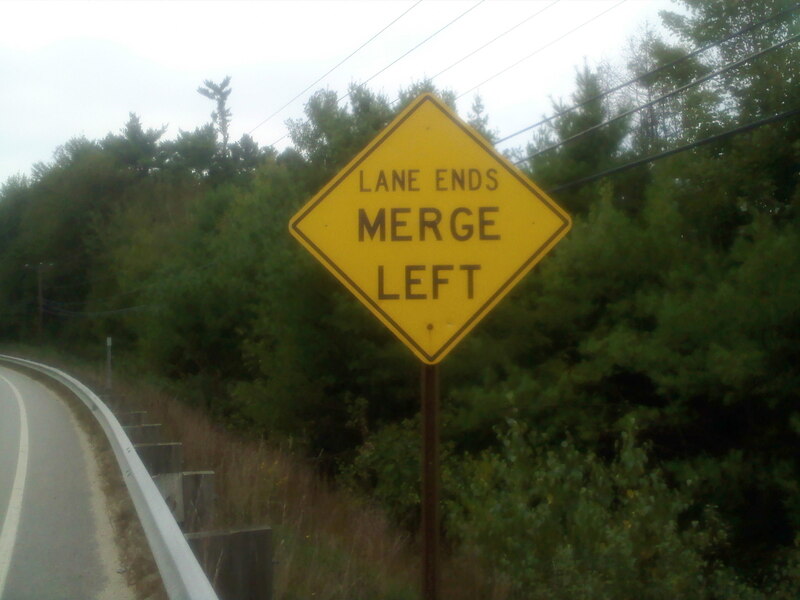 The important part is in NH. Day 1 of 6: This was originally planned to be a 4 day tour. Total mileage was about 250 (400 km). Please see the end of this web page for how to get to and back to a recommended starting point of the ride. 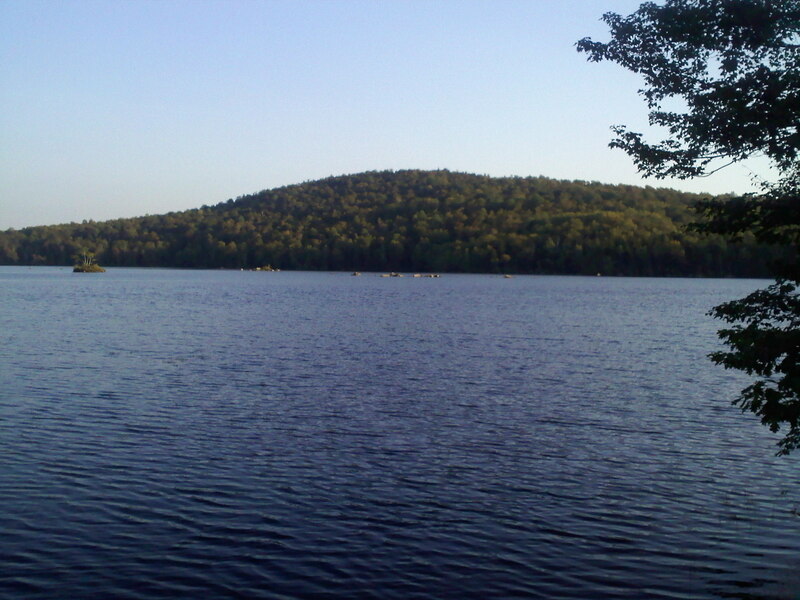 For my first night I stayed at Bear Brook State Park, I have not been there for years. From about the age of 2 to about 14 or 15, a group of relatives 'invaded' that park every year for 2 weeks. Here are some pictures on the way to the park. 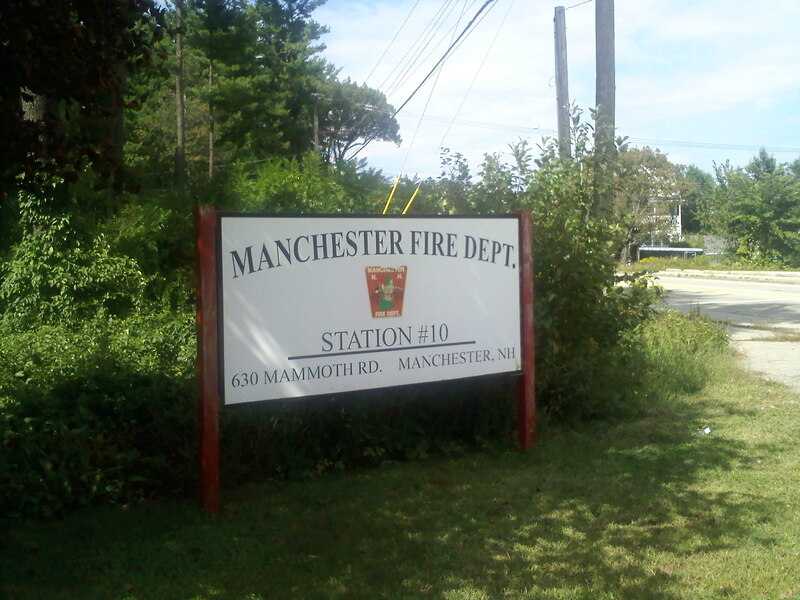 Above you can see were I entered New Hampshire, riding my bike on Route 128 (people in Mass will get laugh), evacuation signs I saw all over the place (not sure why they are there) a special thanks to Station 10 for allowing me to refill my water bottles (thanks guys!) and what some of the roads looked like. 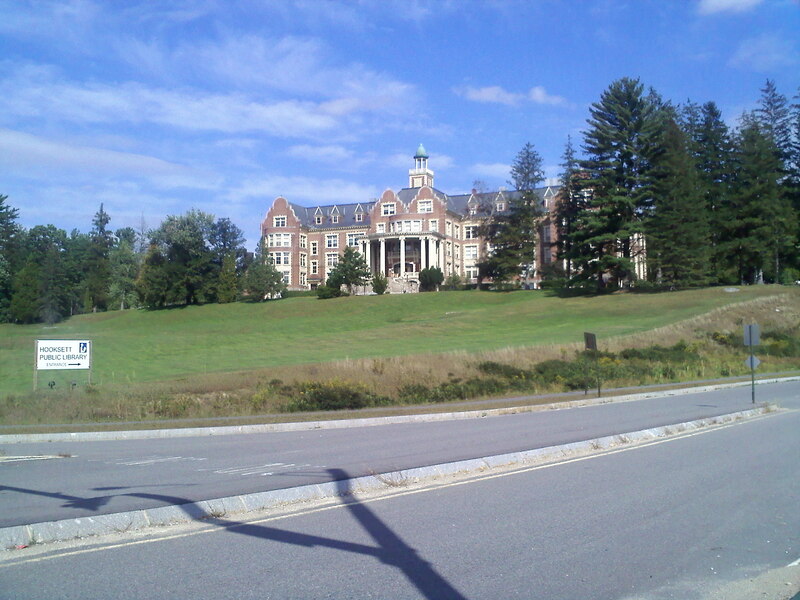 This nice building is the old Mt Saint Mary's College in Hookset NH, fairly close to Bear Brook State Park. Sad to say, one place we use to go to is no more, the Fire Tower at the park was torn down years ago, from the top you got a great view of the whole area. The fireman who worked there would always be happy to have visitors. 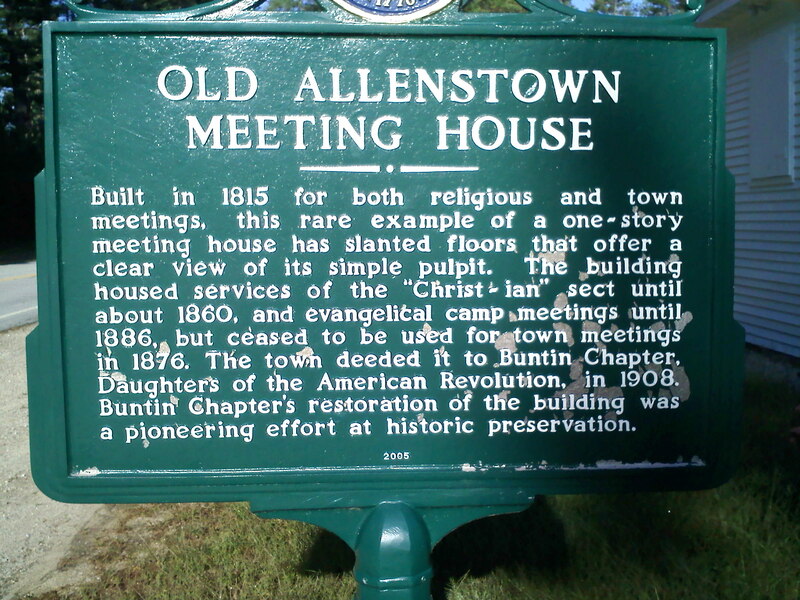 This historic Meeting House is on the way into camp, a close up of the Historical Marker, unfortunately the building was locked. 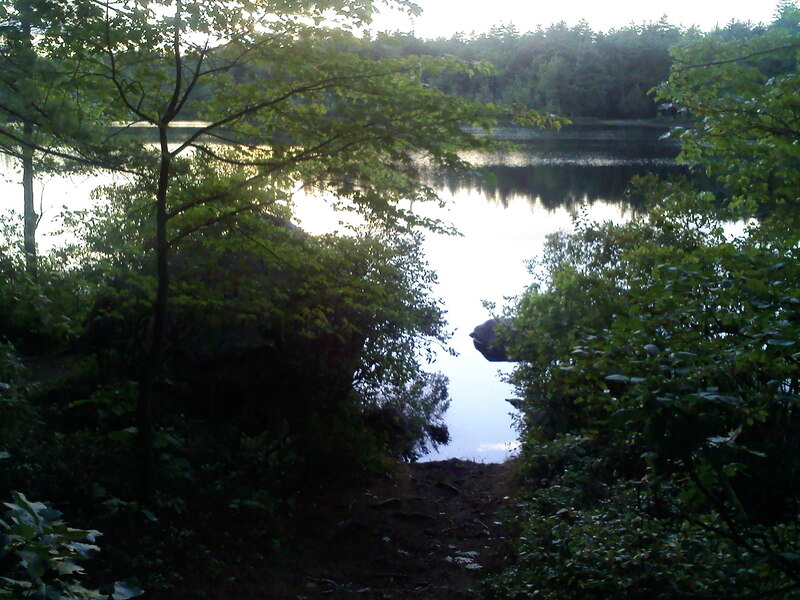 The ride up there was easy due to a nice tail wind, found my way to Route 128 then Route 28>28A>28 to Bear Brook State Park. 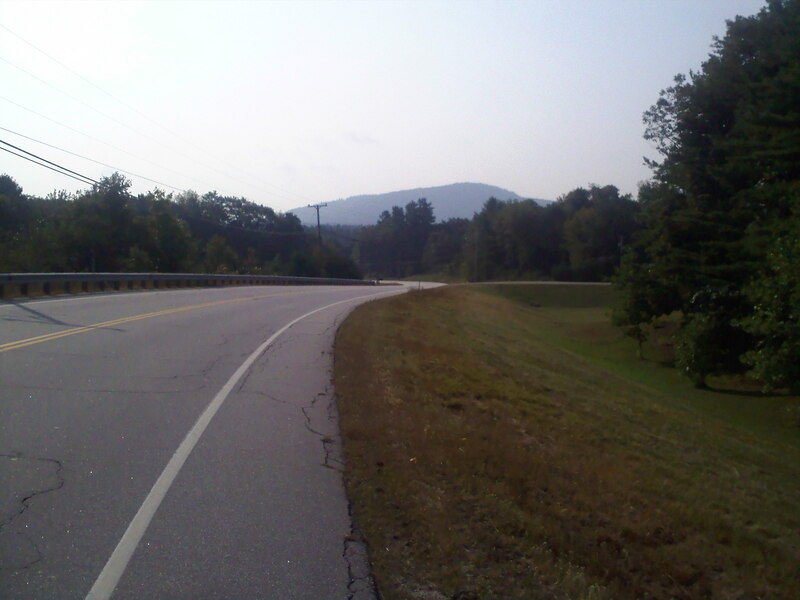 For the most part the ride was quiet, but some areas were urbanized. When we use to go up there years ago, the ride (via auto) was all 'country'. 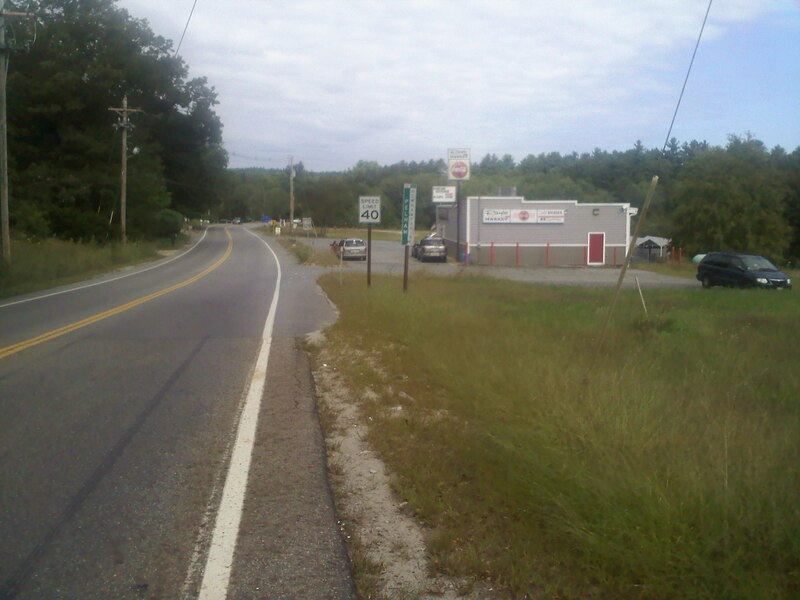 Note, if you need supplies for the night, you should stop at the Gas Station/Deli on the left side of the road in Suncook on Rt 28. 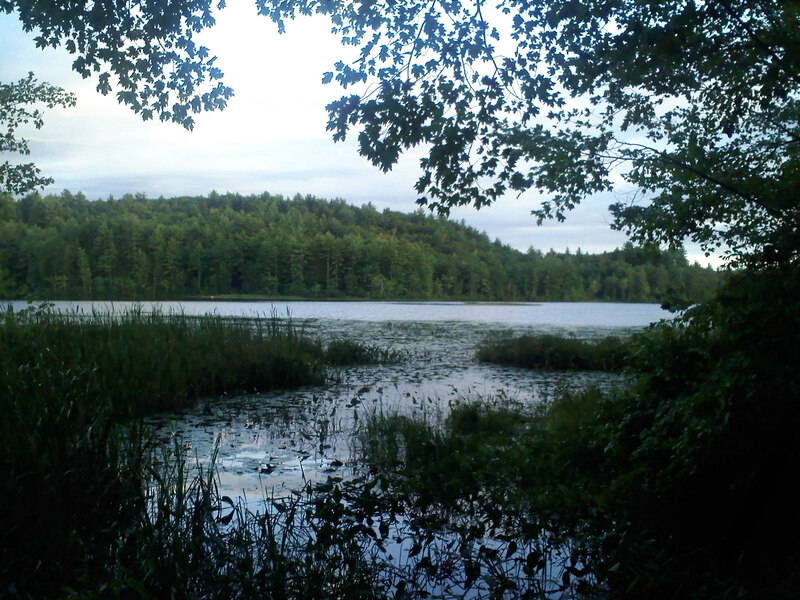 It is the only place I saw fairly close to the camp and is about 5 miles (8km) from camp. A little note on finding the 'real' entrance. After taking the turn when you see the sign, you will see a sign saying 'leaving Bear Brook State Park'. Ignore it, continue on. The road leaves then reenters the Park'. An auto was stopped and I rode up to ask her if I missed the entrance, she was also looking for the entrance and was as confused as I. We both looked at my map and her better eyes noticed how the road seemed to drift out of the park. 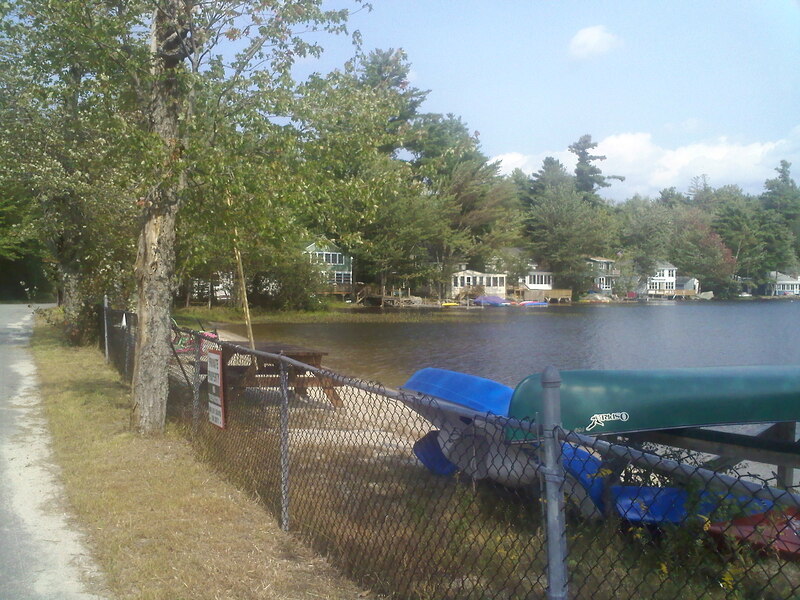 Originally I was suppose to go to Sunapee State Park but I got lost/delayed in Concord NH. I was happily riding north for quite a while before I realized something was wrong. I was trying to find Route 202 west in Concord, but missed the turn when I was too busy being a tourist :) and due to directions from people in Concord. 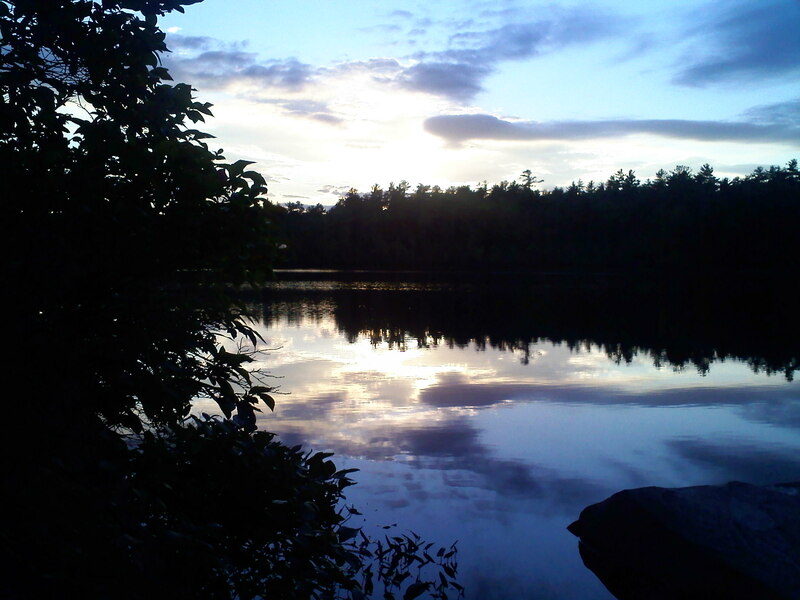 Also I talked to a few people, thus loosing a few hours, so rather than racing to Sunapee to get there before dark, I stopped at "The Maples". The Maples was very nice, owners where great and and I had a very good breakfast, turned out getting lost was a good thing (more below). One of the advantages of planning your own trip, you have no real time table to stick to. I had 6 days left for my vacation, and this was planned as a 4 day ride, I plenty of time for unexpected occurrences or to hang in interesting places. 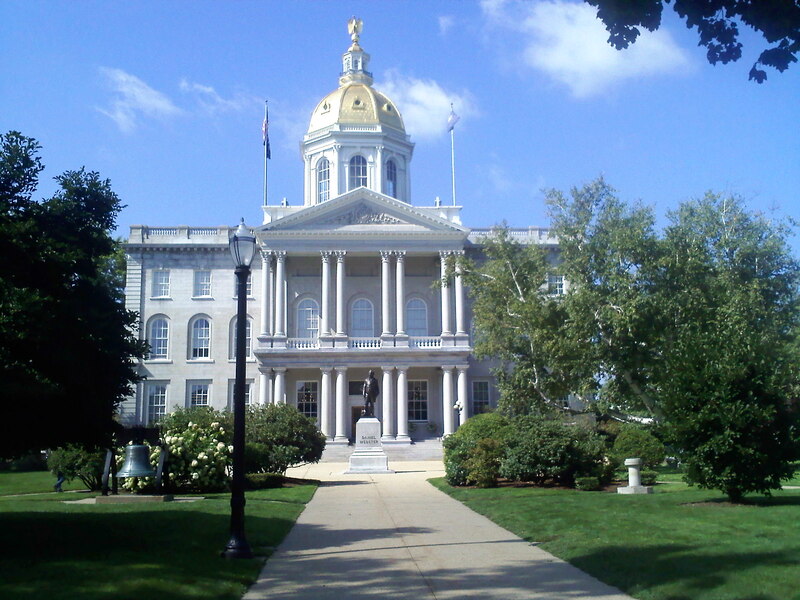 While in Concord, one of the State House tour guides was also a bicycle tourist, so we talked quite a while about riding/touring throughout New Hampshire. So, if it wasn't for the unplanned detour I would not have meet the guy. BTW, New Hampshire creates a very nice set of free bicycle maps for every part of the state. I believe you can still obtain a printed set, I was able score a set 10+ years ago. 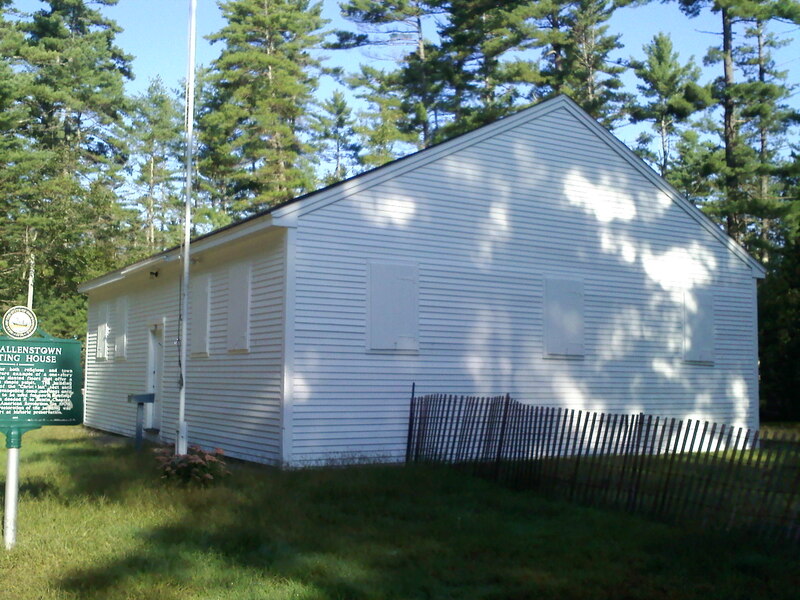 If you plan on touring New Hampshire they are a "must have". Getting to the the Maples from Bear Brook is quite easy for most people :). 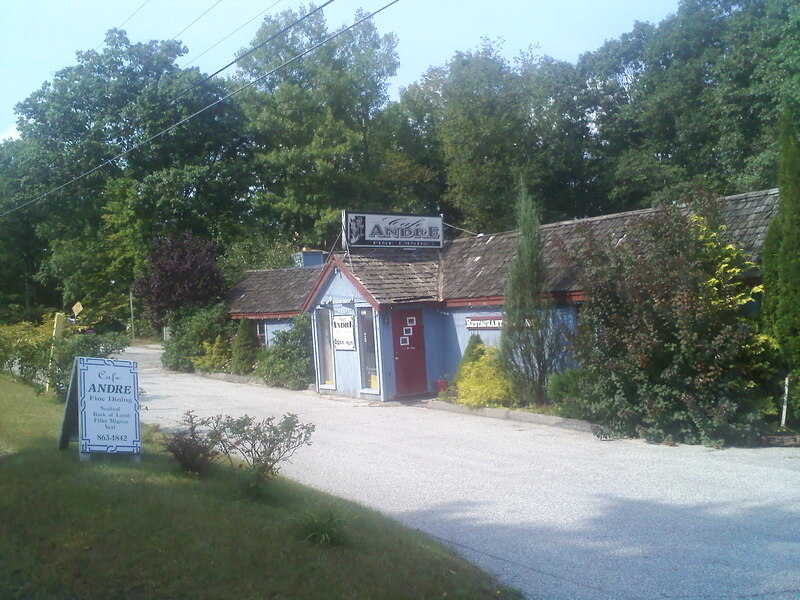 Take Rt 28 North, quick right on to Buck Street, then a left on to Academy Road. 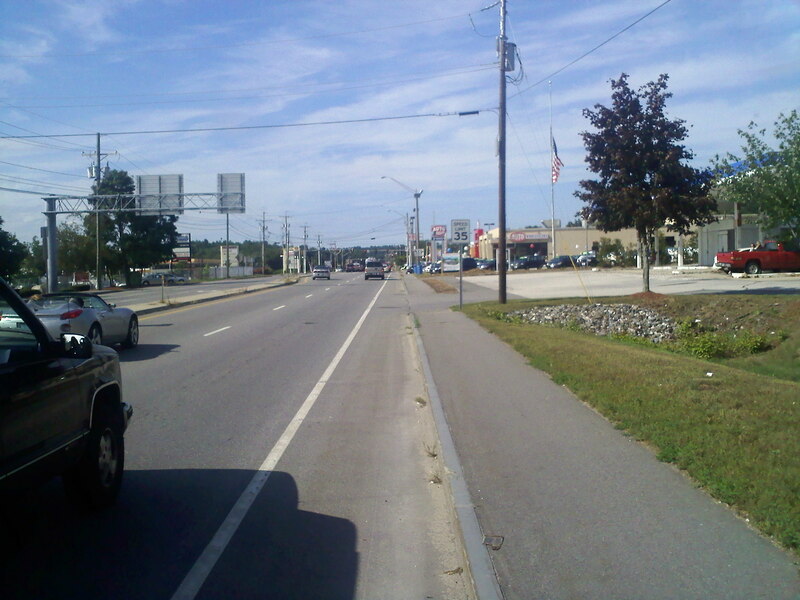 From there you will join Rt 3 North in Pembroke (a very nice town BTW). 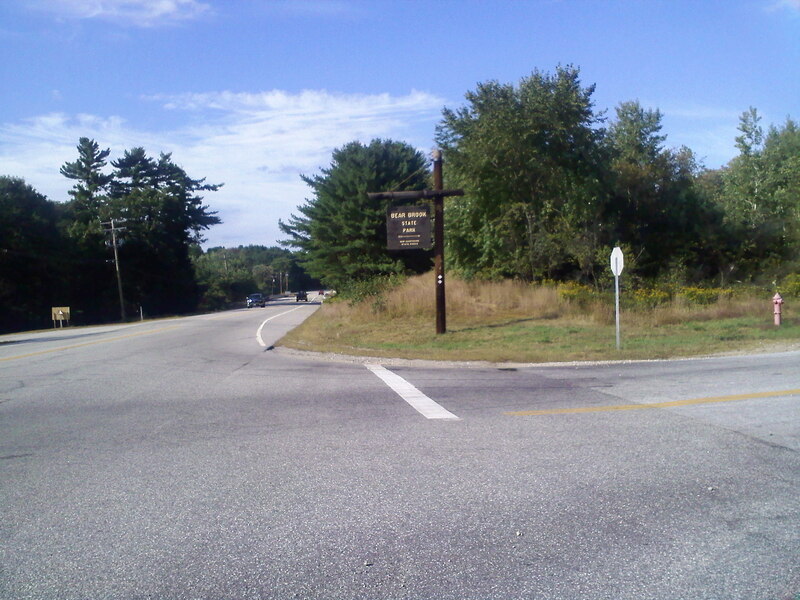 Proceed into Concord and take 202 West (note, called Rt 9 in Concord). 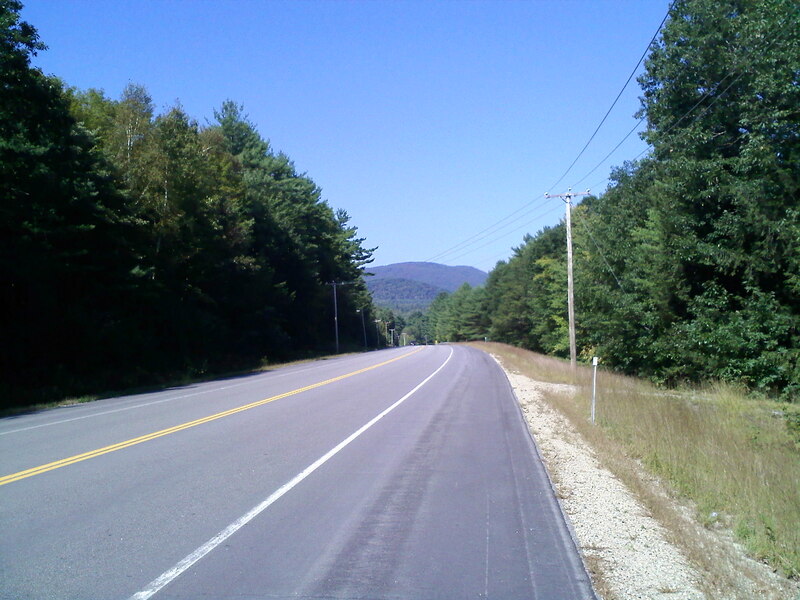 In Hopkinton you follow Rt 103 to the Maples or you can continue on to Sunapee as I originally planned. One thing I noticed, all street signs were very easy to see (except in Concord). 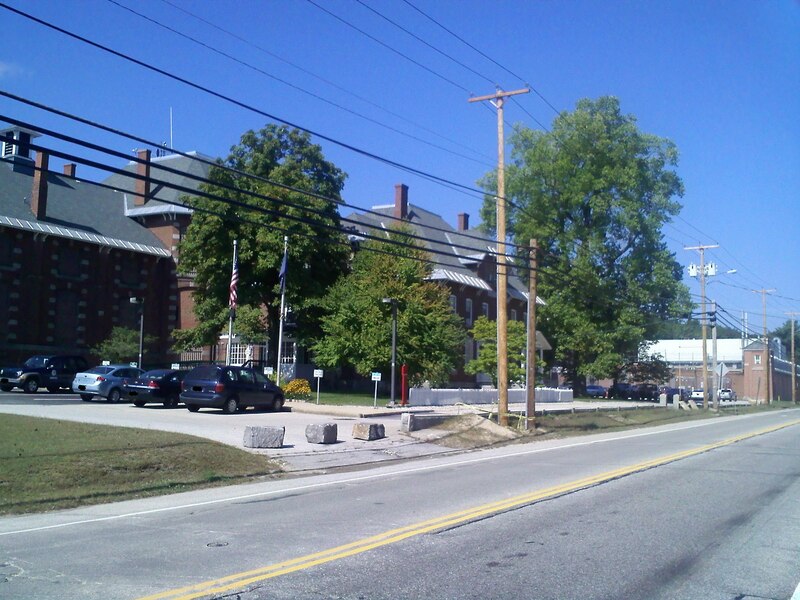 In order, Rt 28, NH State House, a prison, Hopkinton Center, a very good deli in Hopkinton, the Maples and a buddy also staying in the Maples. If you see the State House and/or the prison in Concord, you missed the turn for 202. The ride fairly easy, some long hills on 202, but that route is known for being hilly for just about it's full length, also had a medium head wind. 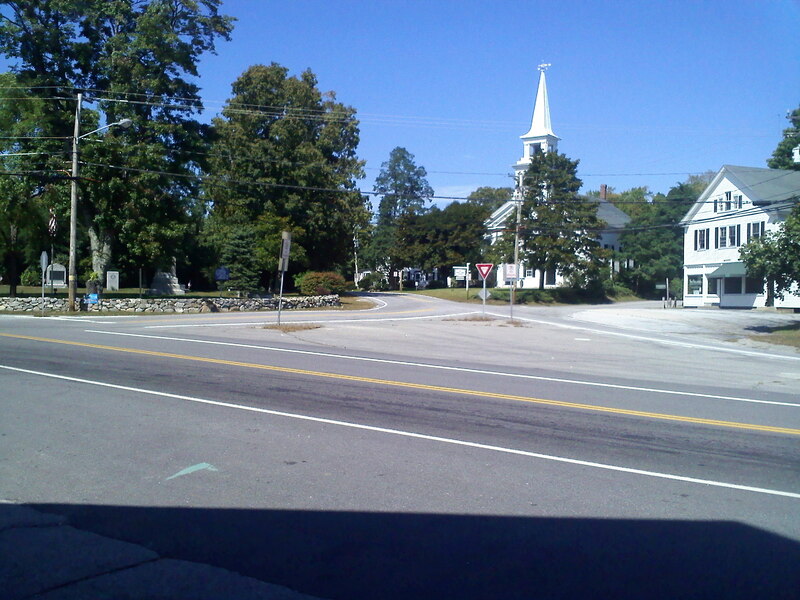 Once on the other side of Concord you saw empty roads and went through some small towns. The town of Warner (where the Maples is) had a few nice shops, but was mostly closed due to the time of year I was riding. A good deal of days 2 and 3 was spent riding on Rt 103. 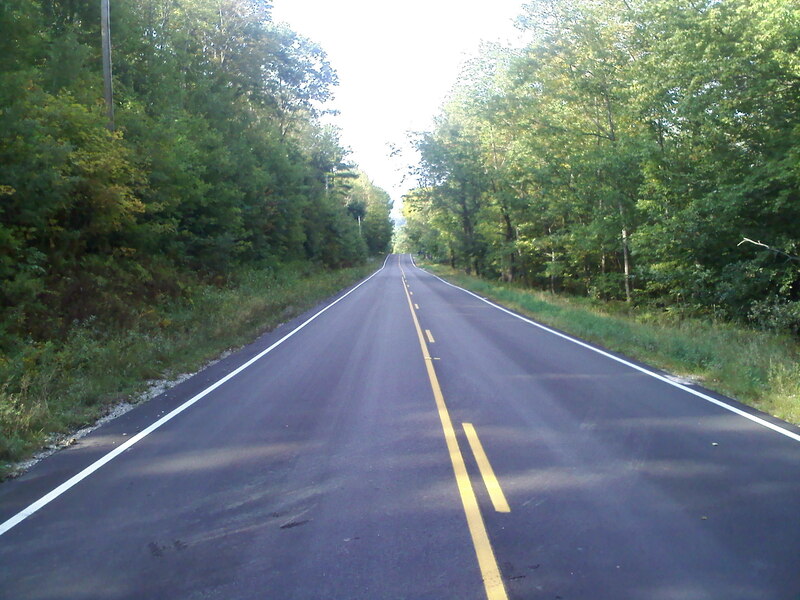 I found that to be an enjoyable road, it gave one the feeling you were in the middle of nowhere. 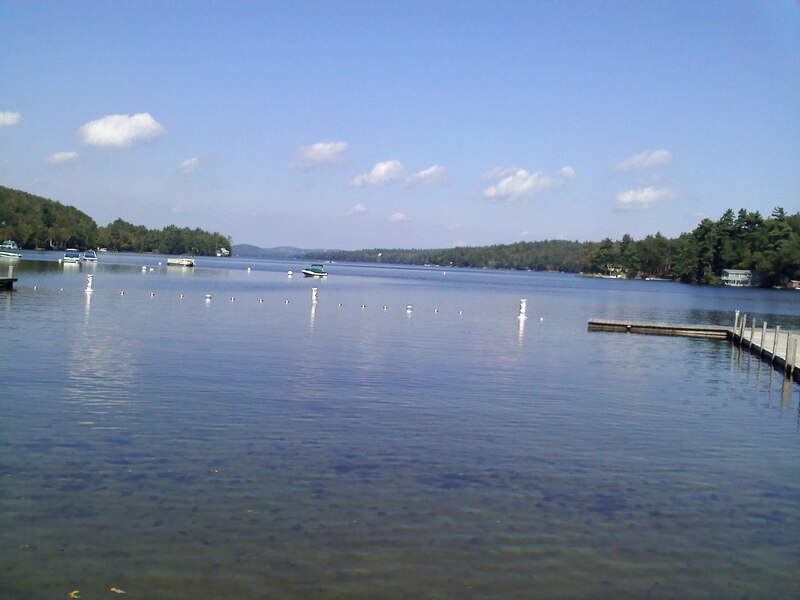 I had always wanted to ride up to Sunapee since I was quite young, I finally made it! 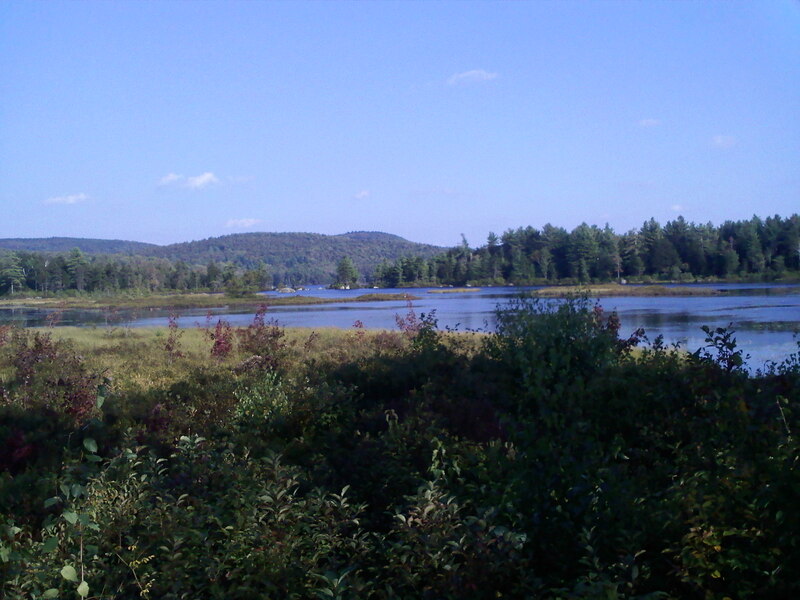 Anyway, I was planning to stay at Sunapee, but after talking to the ranger I decided to continue on to Pillsbury. He seems a bit disappointed I decided to press on, I know the camp there would be very nice but decided it would be best to continue. 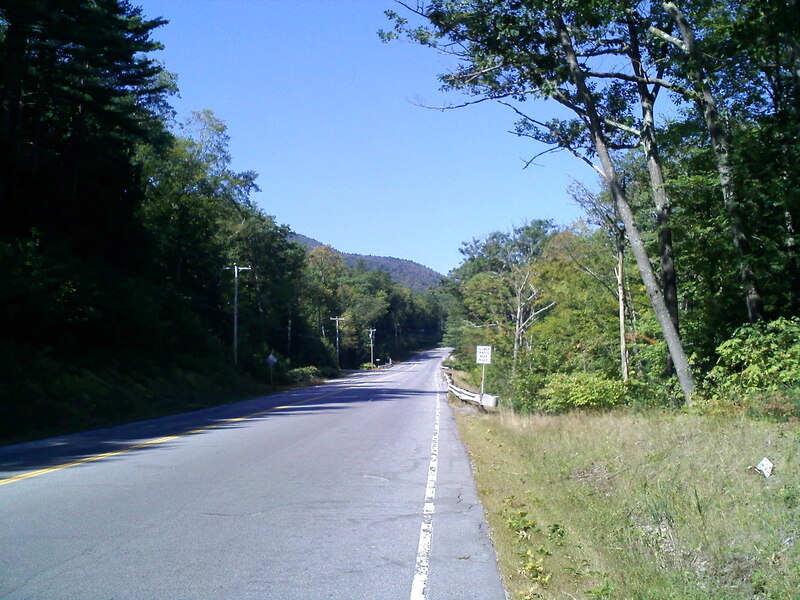 Since the ride to Sunapee was short and I am familiar with the area, I spent quite a bit of time there looking around Mt Sunapee. There was some type of corporate outing going on there, so when I arrived with my packed bike lots of people took notice of me and a few asked where I was going. 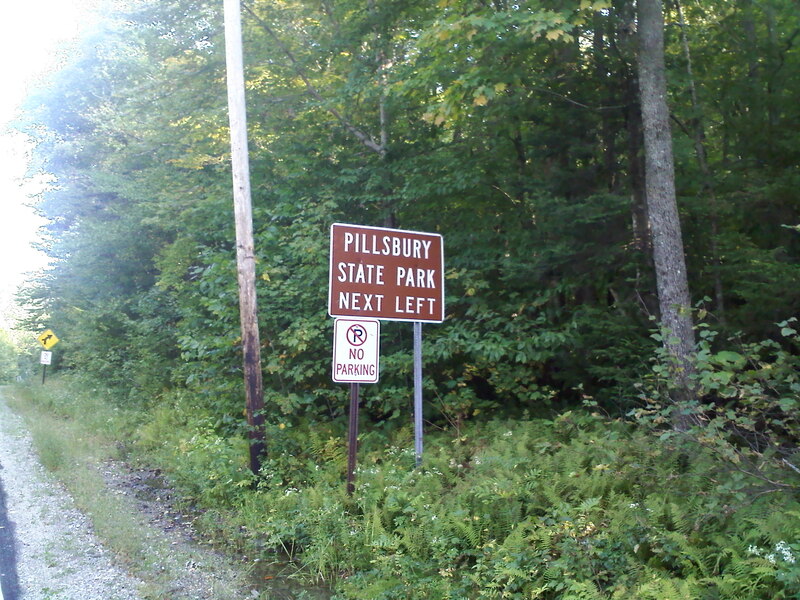 Turned out, going to Pillsbury to camp was a very good decision, the ride there is difficult and according to veloroutes, many of the climbs between Sunapee and Pillsbury had a around 29% grade, a few had a 30% grade, which I find hard to believe, but it was one real tough section. It added 11 miles (17 km) and close to being all up hill, but it is very beautiful section. 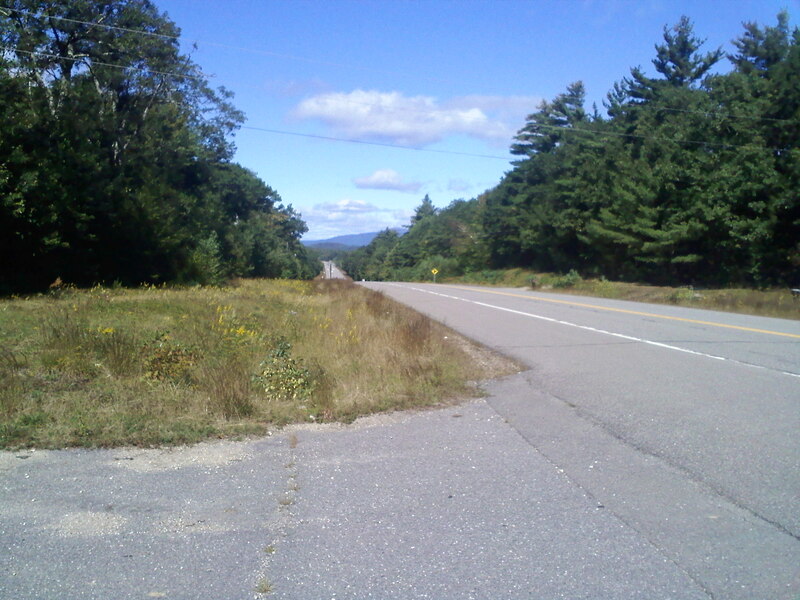 So instead of staying at Sunapee and having a very short ride on day 3, I ended up in Pillsbury and turned what could have been a somewhat hard day 4 into an easy day. Pillsbury is very primitive but pretty park, except for one thing I would consider this the best campground I have ever been at. 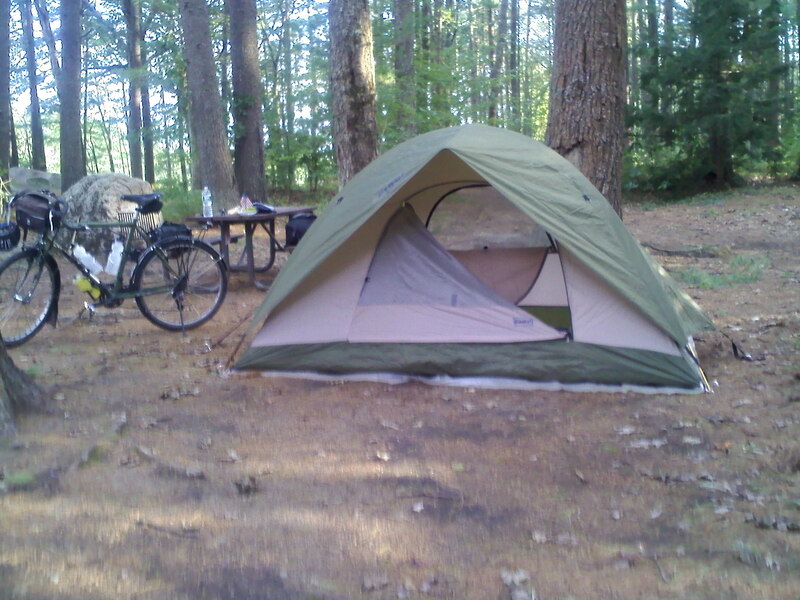 Actually I still think it is the best campground I have stayed at. If people snoring do not bother you, then the sound the Wind Mills make will probably be OK. 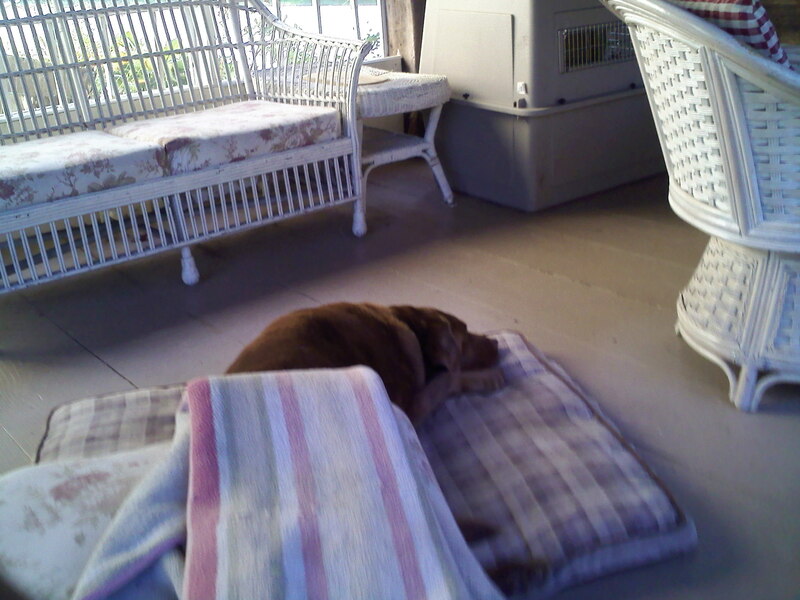 But for me, it took me quite a while to fall asleep. The sound is like a jet engine, but "modulating", right now there 7 wind mills at the Farm. While at the park I hung out with the nice people next door, they told me about the area, the park and we joked around. Made for a fun night. the pictures do not do the Park justice. On the way up, I heard a clink. I stopped a short distance on one of the few semi-level areas and checked out the bike, all OK. 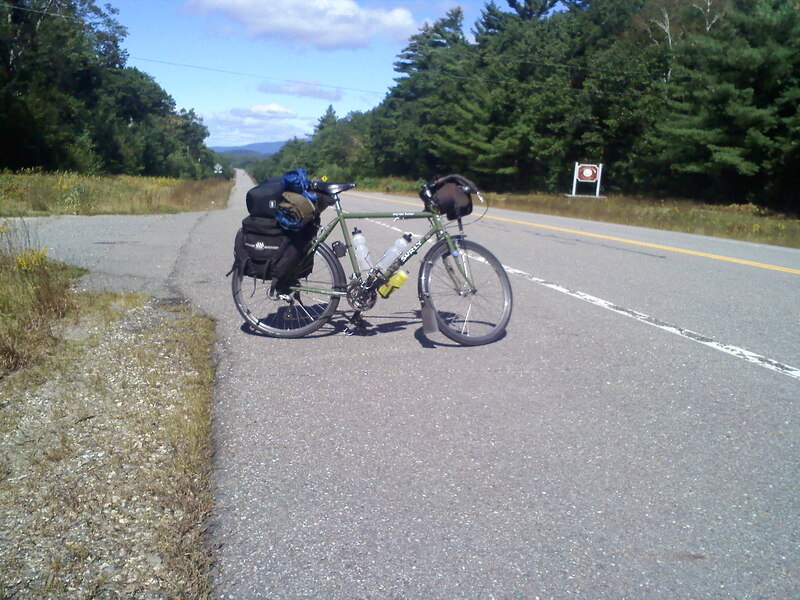 Even where I stopped, with the kickstand the bike wanted to roll downhill. I then realized the compartment that had my bike lock was open, the clink was the lock falling out. I decided to continue, was too lazy to re-climb that section. That lock was quite old, but cool. Been looking for a suitable replacement sense but no luck. If you are planning on staying at Pillsbury I cannot emphasize this enough, pick up some supplies on the way there, even water. 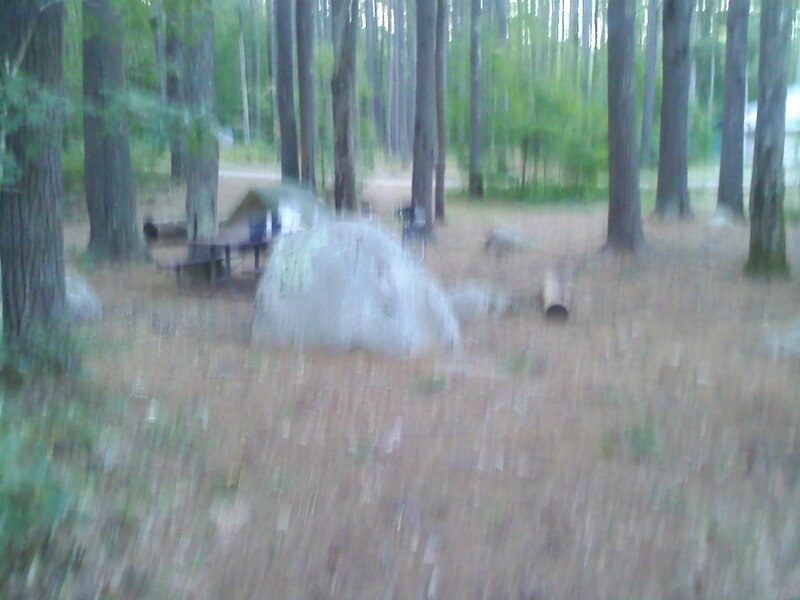 The park is primitive and there is a open question on whether the water at the camp is OK to drink. I suspect it is, some campers did not know, others said no. I decided not to chance it. 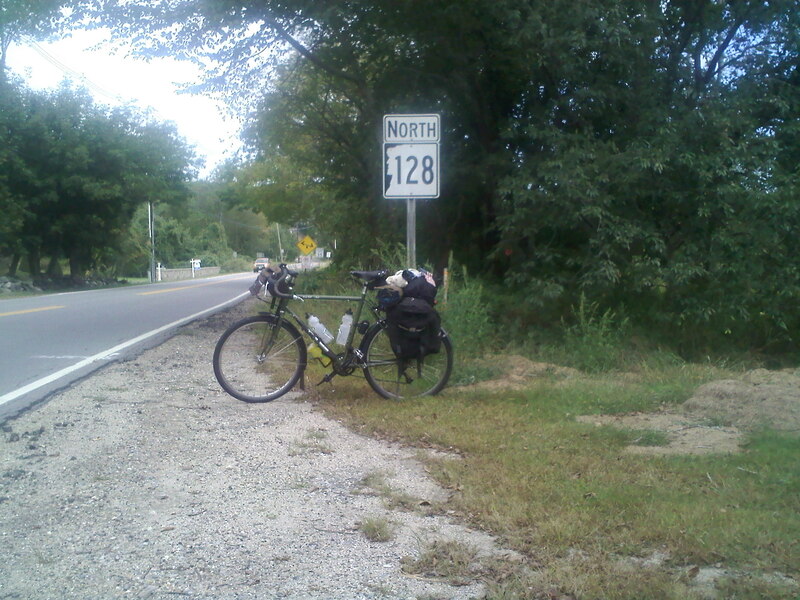 Goshen is where I picked up supplies, from there I think you have around 5 hard miles (8 km) left. 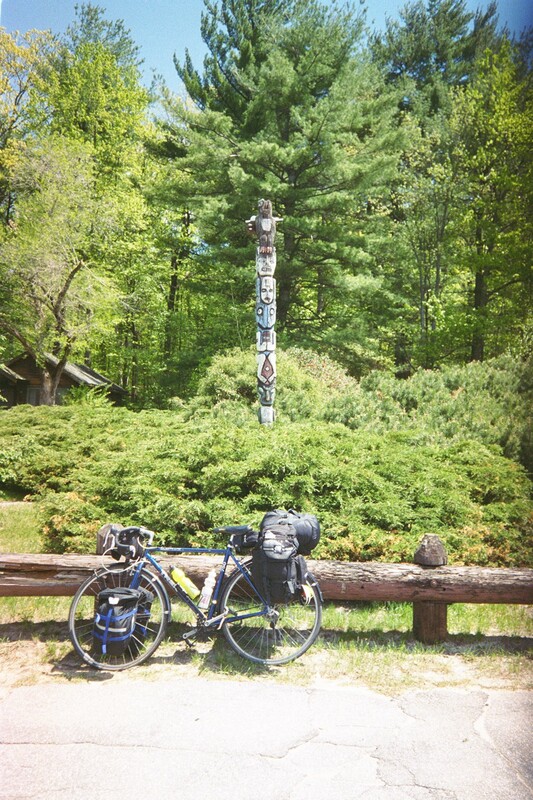 Sorry, I need to repeat myself :) Pick up supplies in Goshen, the last thing you want to do is ride up that Rt 31 wall if you find out you need something after setting up Camp. I woke up rested in spite of this. My camp neighbors said the Windmills power about 30,000 homes, which seems quite impressive since there are only 7 of them. I did not take many pictures of this part of the ride because I was rushing to beat the thunderstorms predicted for the afternoon. 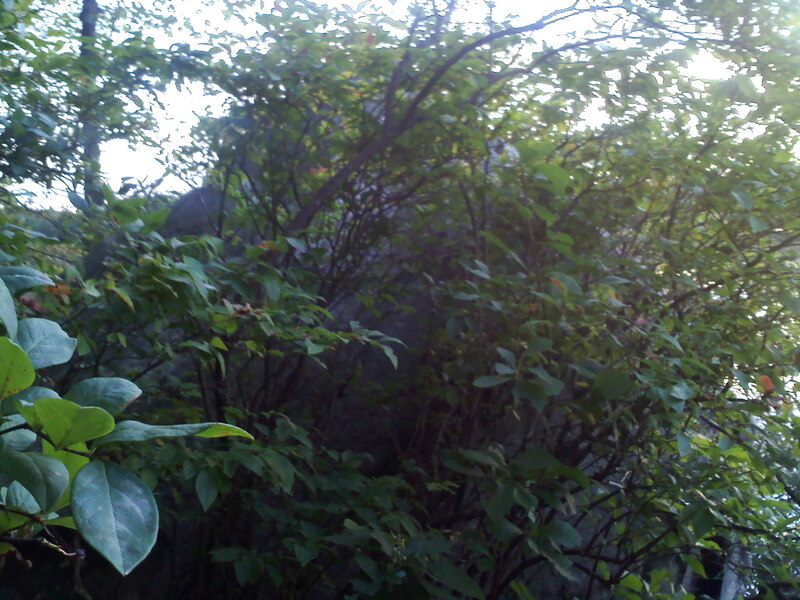 The first picture is the start of a very long and fast downhill, in fact the day trended downhill. 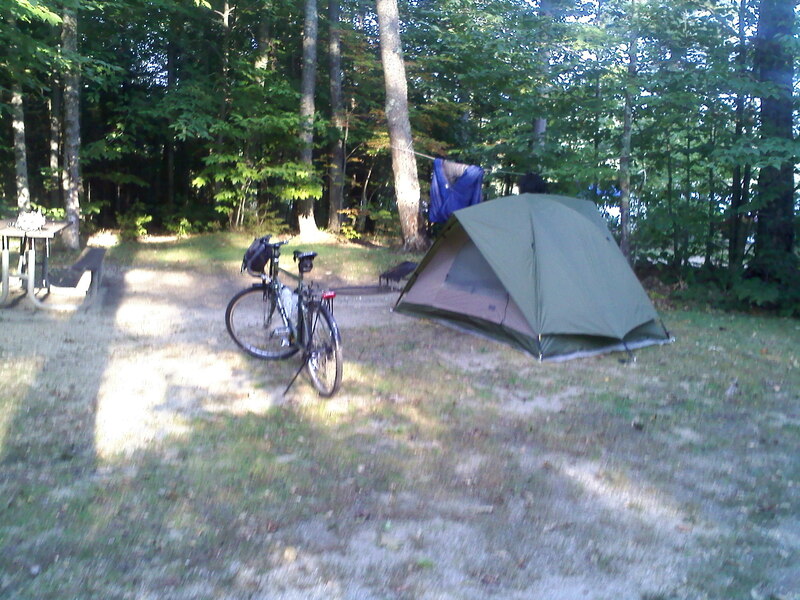 Next is what became favorite sign (usually at the top of a long steep hill) and last is my campsite in Monadnock. 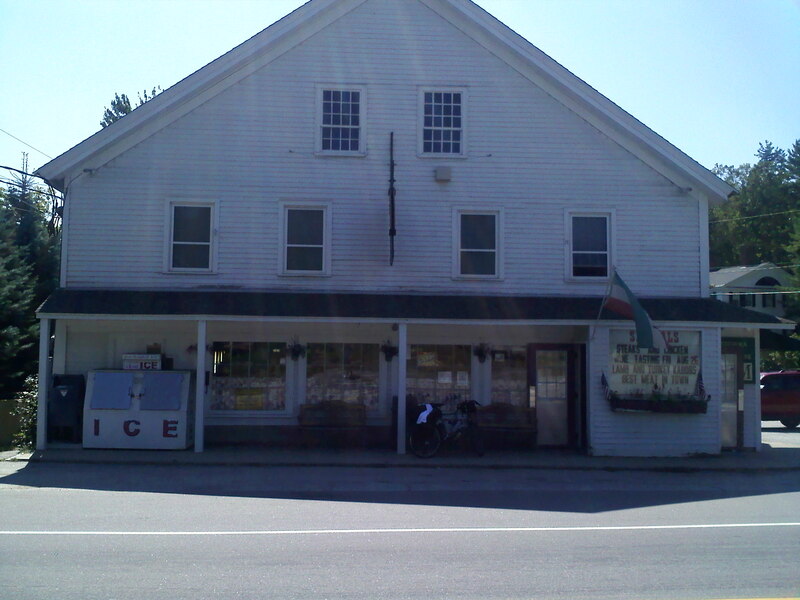 I rode to Monadnock by heading south on Rt 31, had a very good breakfast in Washington in a combination General Store/Diner. Continued south on 31 where it joined with 202 in Hillsboro. When in Hillsboro signs get quite confusing, I asked a gentleman parked in front of a convenience store how to get to 202. 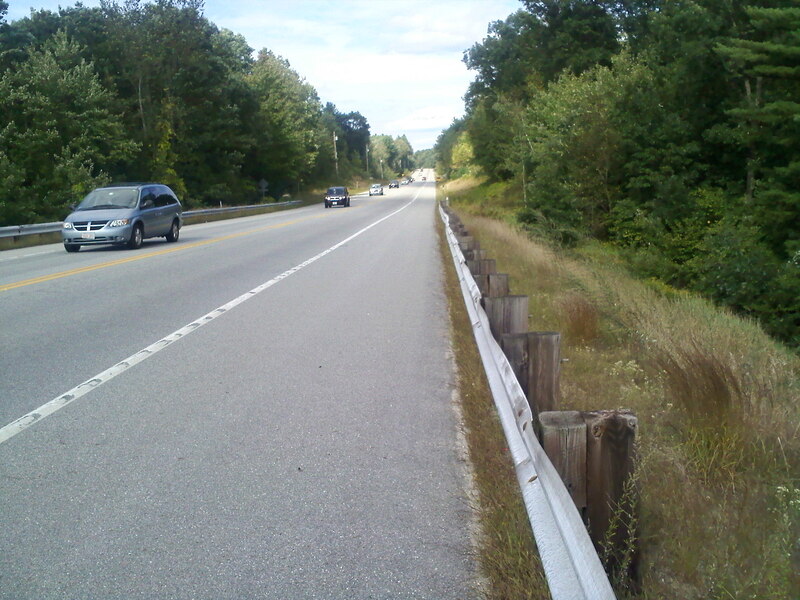 He said continue straight on the "2nd New Hampshire Turnpike" and that will join with 202. Seems 31 branches off somewhere, but taking 2nd New Hampshire Turnpike makes for a slightly shorter ride and far less traffic. I guess people in Hillsboro can find 202 much easier than people in Concord :) I did find Route 202 and a bit later I joined back with Route 31, to me his directions made for a less confusing route. From here you continue on 202 all the way to Jaffery. Once in Jaffery. 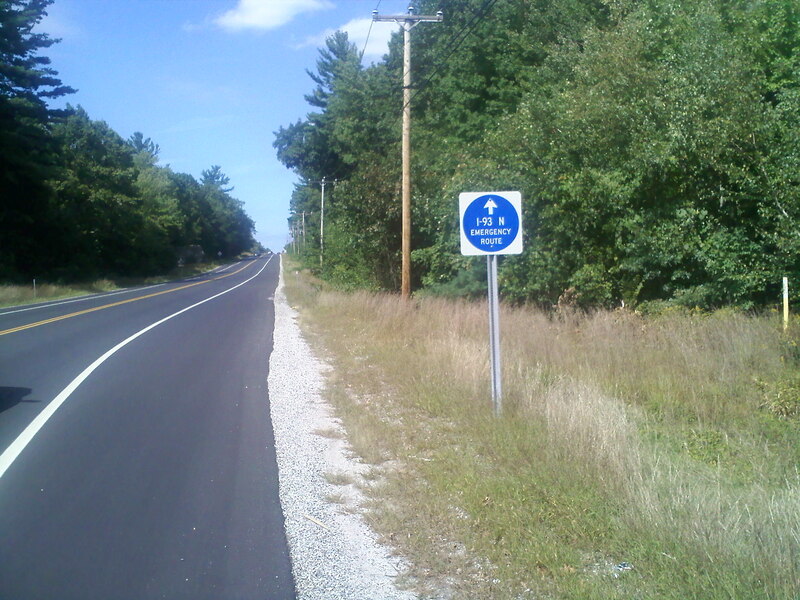 it is an easy ~6 mile (9km) ride to Monadnock by following the signs. 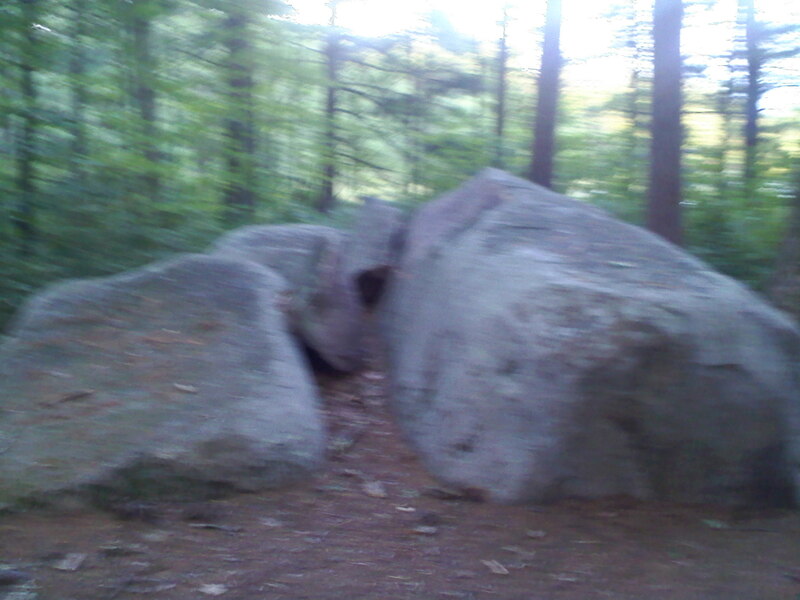 You can see my 2010 Monadnock trip for more details on how to get to Monadnock from Jaffery. Not much to say here, due to the weather decided to stay put. Late yesterday and last night there was quite a thunderstorm which was interesting. So I spent the day reading and napping cozy in my tent. Forecast was heavy rain for the day, luckily we had a short break in the weather at midday. That allowed me to go to Jaffery to pick up supplies for the day and do laundry. Started drizzling on the way back to camp, then once I was settled back in the tent the heavy rain started again. The rain stopped around 10:00PM, then we got heavy winds for most of the night. After the rain stopped, the temperature quickly dropped to 35 F (1 C). But I was not cold due to a new sleeping bag I picked up earlier this year (more on that below). 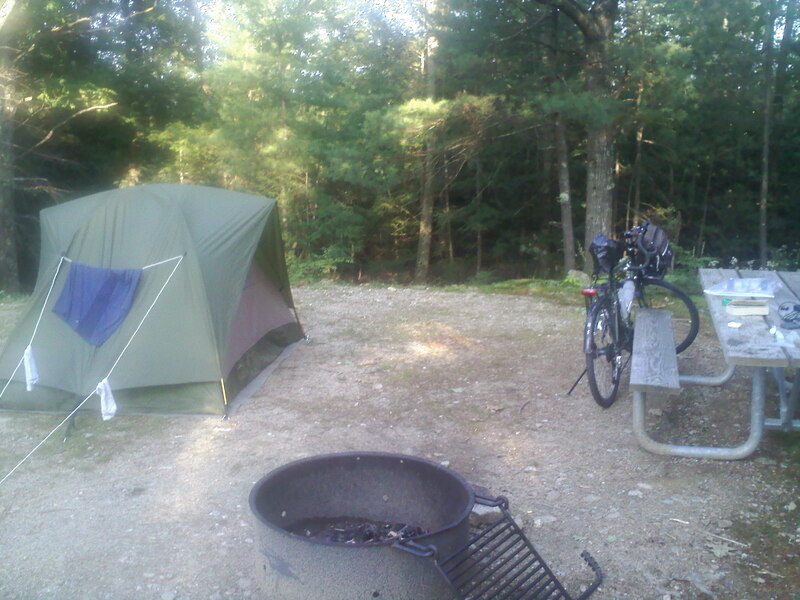 The campground at Monadnock is quite nice, but something about the Mountain that seems to attract heavy winds. I guess the winds must blow off the Mountain straight to the Camp. If you need a place to camp in the area I would check it out, I think it is a great place to camp and you can become one of the may people who climb the Mountain. Deja vu, have I been here before ? Day four of this trip is exactly how I got home, again all down hill with a strong tail wind! I did find another good diner in Jaffery. 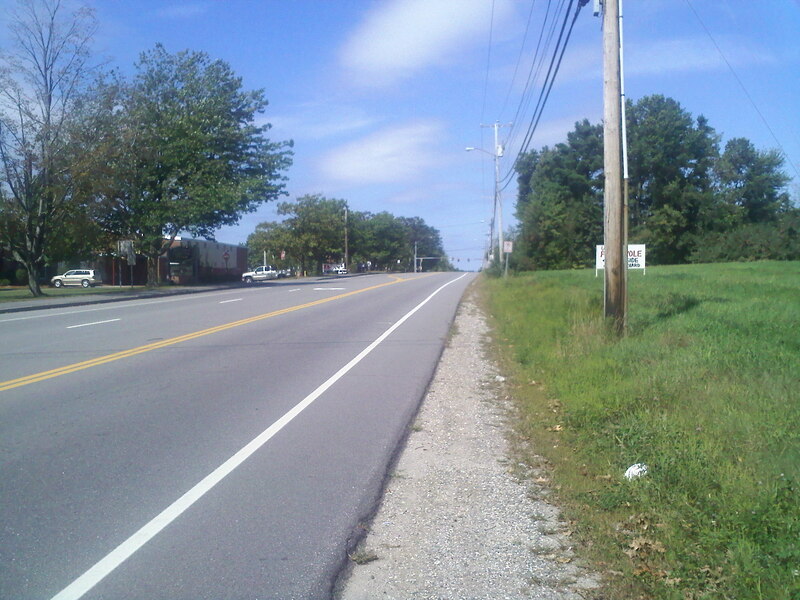 A short distance on Rt 202 West from Jaffery there is a strip mall on the right. Had a good dinner and a nice laundry-mat. of Rt 119 to show the mountains I am coming from. You can go to here on day 4 for more details of this section of my trip. This time the ride home was quite cool, did not get above 55 F (12 C), started out around 40 F (4 C). But the ride was as nice as I remembered it from last year. This trip was a lot of fun. Everything I packed I used and I did not need anything else. 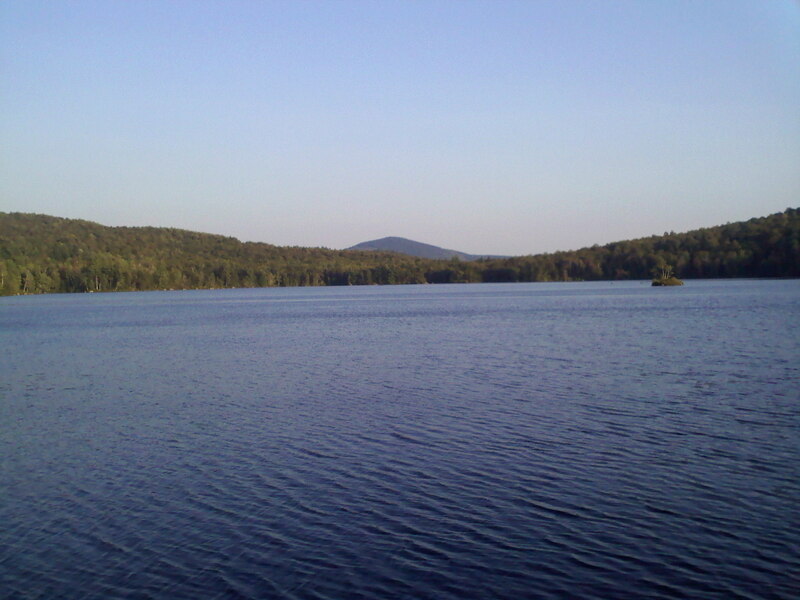 I knew exactly what to take because I knew what to expect in Sunapee, Bear Brook and Monadnock. So, only on Days 2 and 4 was I in unfamiliar territory. For this trip a bought a mummy type sleeping bag which was on sale at the time. I wanted something that was lighter and more compact than my old sleeping bag. At first I did not like it at all, but finally started to get use to it on day 3. When the temperature dropped on day 5 to 35 F (1 C) I was very glad I had it. 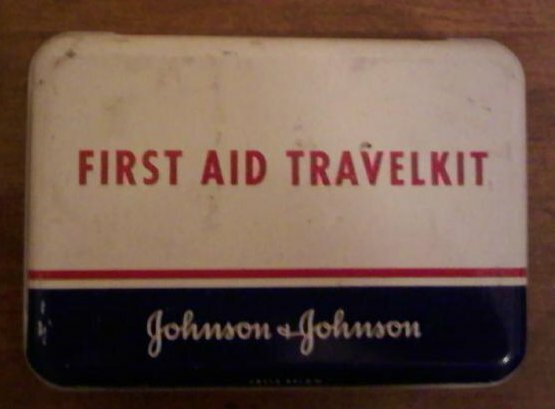 I know in the old bag I would have been a bit chilly based upon the trip I took last year. The bag got to be comfortable and I was not hot or cold, note I have never used a mummy bag until this year. So, with the weight savings and the size difference I am glad I picked it up. Who needs a charged cell phone :) Actually, I was able to charge my cell phone at all the places I stayed except for Pillsbury. As I mentioned, that park is very primitive and has no electricity, even the rangers who work there lack. But, the very nice couple at "General Store/Diner" in Washington allowed me to charge the phone while I ate breakfast. It is about 4 miles (6.5 km) from Pillsbury on 31 south. 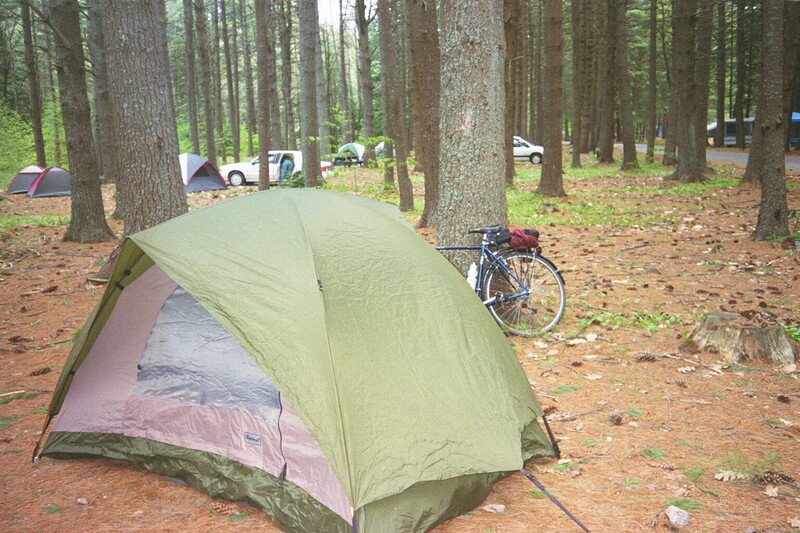 I may do this trip again someday, but I believe this would be a very good first bicycle touring trip for a very small group of people or for just one person. If you do not live in the area, all you need to do is get to Boston, maybe take an early MBTA Train to Lowell. You are allowed to bring your bicycle on the train in the morning when going from Boston to Lowell. Once you get off the train you can follow this 1.4 mile (2.2 km) Urban Route North from the Train Station to the start of the ride on Mammoth Road. In case the site is gone, here is a print of the route. Now you are at the start of "my day one" of this tour. Just continue north on Mammoth Road. 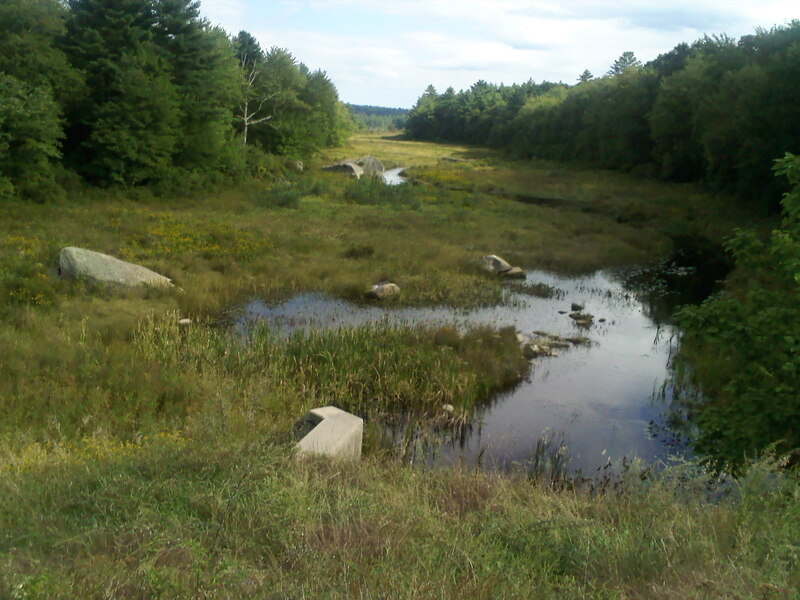 Notice Route 113 in the map along the north side of the Merrimack River ? Getting back to the train from Monadnock is quite easy, just follow Route 119 East (south?) 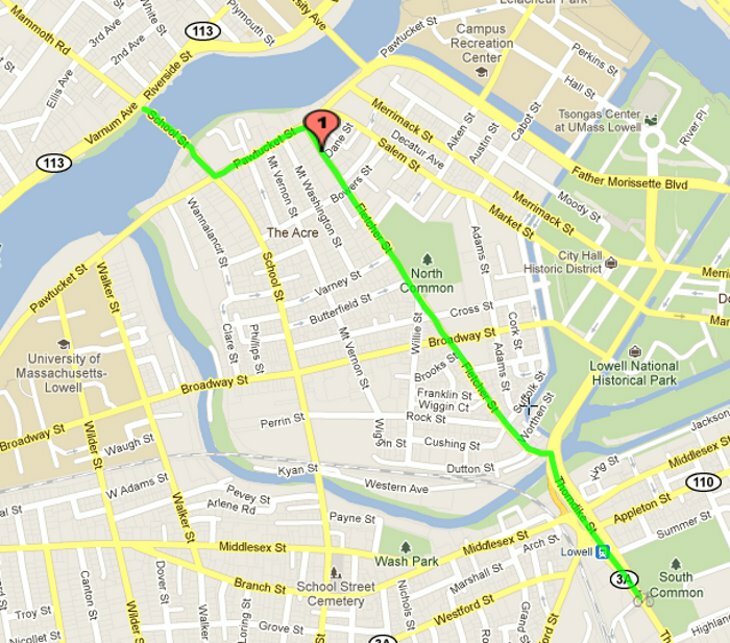 and take Route 113 East and you will see the bridge where you started from in Lowell. 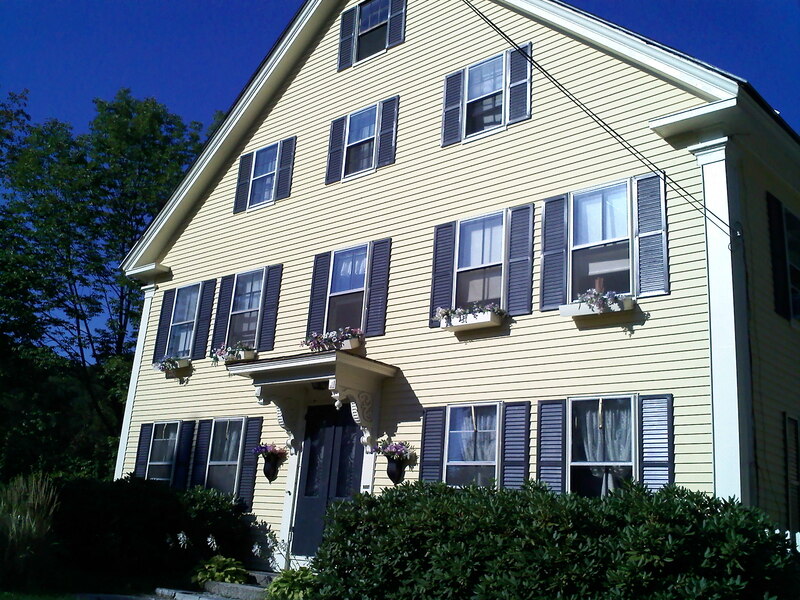 Just head south on 3A to the Lowell Train Station. The distance will be around 54 miles (87 km), give or take, I do not have the exact reading.